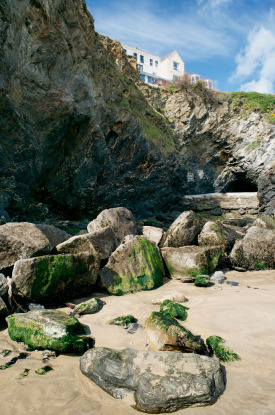 Newquay (pop. 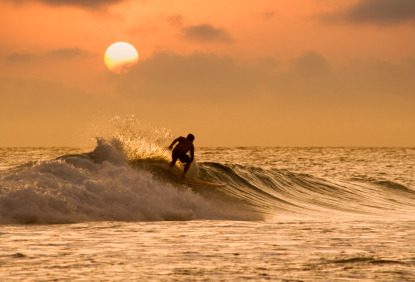 18,000) is the surfing capital of England as well as one of its most crowded beach resort (the summer population booms to 100,000, over fivefold that of the rest of the year). It's a good place to party (in summertime the town is full of nightclubs and girls in bikini), sunbathe or catch a wave, but if that is not your idea of fun, don't bother coming here. The small village of Towan Blystra was first mentioned in the 15th century, and in in 1439 the locals applied to the bishop of Lacey Exeter to build a "New quay" from which the town derives it's current name. The economy was almost exclusively based on pilchard fishing before the arrival of tourism. Many people come to Newquay to surf. This isn't Hawaii or Australia, but that's as good as it gets in the British Isles. The best surfing beach is Fistral Beach. If you prefer to relaxing stroll on the beach, the 3.5 km (2 mi.) long Waterbay Bay is what you are looking for. Hikers will press on to Towan Head, a place commanding great views on the town, beaches and the sea. When you get bored of the beach or feel like seeing other animals than the party variety, head for the Blue Reef Aquarium, or the Newquay Zoo. For days of bad weather, Newquay Waterworld has a tropical swimming pool with a 60m slope as well as a fitness centre. 5 km (3 mi.) southeast of Newquay is the fine Elizabethan manor of Trecice (open 28 March to 31 October, 11am to 5:30pm; closed on Saturdays, and also Tuesdays before 19 July and after 12 Sept.; admission £4.70). It was built in 1571 and retains much of its original splendour. The interior decoration includes plaster ceilings, Stuart portraits, clocks and 17-18th century oak and walnut furniture. But what distinguishes Terrice from other stately homes is its rare collection of lawn-mowers (about 100 pieces) in the great barn. 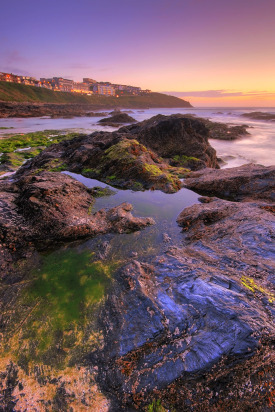 Newquay is the gateway to Cornwall for long-distance travellers, thanks to Newquay Cornwall Airport, the only airport in the region. 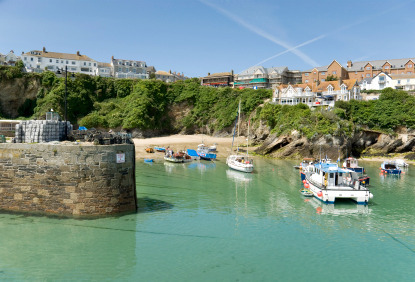 Journeys by train, bus or car from London take many long hours, especially to the remoter corners of the peninsula, such as St Ives or Penzance. 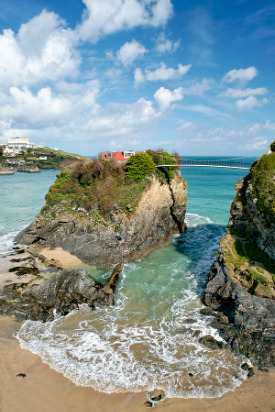 Flying to Newquay can be an appreciable time-saver. The airport has flights from Düsseldorf, London Gatwick, London City, Bristol, Manchester, Leeds Bradford, Newcastle, Glasgow, Edinburgh, Belfast, Dublin, Cork, as well as onward to the Isles of Scilly. The airport is located 10 km (6 mi.) from the centre, which takes about 15 minutes by car (£ 12-15 by taxi). Train is the fastest alternative to flying. Newquay has semi-direct rail links from London Paddington (6h, £55 super advance single), Exeter (3h30min to 2h45min, £20.70), Plymouth (1h30min, £9.20) - all requiring a change at Par (45min, £4.30) . National Express has coaches from London (7h, £33), Exeter (3h30min, £16.50), Plymouth (1h50min, £5.25), Penzance (1h30min, £4.75) and St Ives (1h15min, £4.75).